Way back in 1988, one of the very first official things MAMA ever did, if we ever did anything "official", was to adopt Dave Roehrle's drawing of a very traditionally customized 1949 Mercury as our logo. With a smoothly chopped top, Buick side trim, lakes pipes, 1958 Cadillac wheel covers, dual Appleton spotlights, bullet taillight, and cruiser skirts it just seemed to fit the club perfectly. The funny thing about it, though, is that Dave's original drawing was in black and white, yet everyone has always assumed the car was/is/should be yellow on top and black on the lower sides. 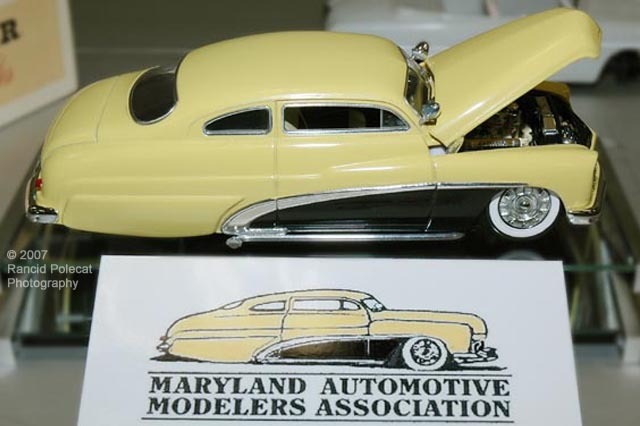 With the recent release of the new Revell 1949 Mercury custom kit, club president Lyle Willits got to thinking about the fact that in the nineteen years of MAMA's existence, no one has ever built a model of the logo. So with an anomalous sense of duty, Lyle determined that the responsibility was on his shoulders to bring Dave's drawing into 3-D.